At McIntosh Industries Inc. in Hillside, a large elevator motor from the 110-story Sears Willis Tower in Chicago lies on a flatbed truck awaiting repair in the company’s loading dock. A niche player in the nation’s elevator servicing industry, McIntosh has landed yet another impressive contract, this one to repair an elevator motor from North America’s tallest building. As its business has expanded, however, the company has had to deal with a challenge almost as big as the Tower itself in its search for new mechanics, machinists and motor winders. 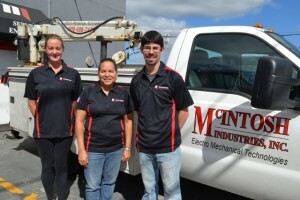 McIntosh Industries employees (left-right) Jessica Dare, Robin Reed and Pete McIntosh II pose outside of the company’s elevator motor-repair shop in Hillside, near Newark, NJ. “It’s difficult finding the right people for the job,” said Sonia M. Frontera, wife of company founder Peter McIntosh. By “right people,” she meant people who had both the technical and softer skills needed to succeed at McIntosh. This sentiment is universally shared by hundreds of thousands – if not millions – of companies in advanced manufacturing and related service industries throughout New Jersey and the nation. Fortunately for McIntosh Industries, the NJ Community College Consortium for Education & Workforce Development reached out to the company last year to find out if it might be interested in hiring one or more individuals soon to graduate from an advanced manufacturing class held in a mobile trailer making its debut at Raritan Valley Community College. “(My husband) Peter came to visit the trailer with me. We were very impressed with the trailer, the (training) equipment and the quality of the students,” recalled Frontera, an immigration attorney with professional HR experience who steps in to help with the family business when she is needed. Among the students who impressed them was Robin Reed, whom they initially hired as a mechanic-in-training after she graduated from Raritan’s CNC metal fabrication class. There, she learned how to work mathematical formulas, read blueprints, use a micrometer and operate a computer-controlled lathe. The company quickly moved Reed to a logistics job after the company decided her past experience as a corporate retail planner matched their need for an employee to track inventory and manage shipping and receiving, said office manager Jessica Dare. “She created an inventory tracking system for our copper wire. She came up with the system, and we’re using it,” said Dare, noting that Reed is bright, organized, hardworking, flexible and mechanically inclined – a perfect fit. McIntosh Industries currently has about 25 employees, most of whom do mechanical or machine work. The company has hired another individual through the Consortium’s Advanced Manufacturing Training (AMT) Initiative as a mechanic in training. “He shows lots of promise,” Dare said. Over the past few years, 293 individuals have been trained through the Consortium’s AMT Initiative, with 90 percent of graduates on average finding work as a result. This story was originally published in the November 2015 issue of New Jersey Business, the magazine of the New Jersey Business & Industry Association. The author is Christopher Biddle, President of Biddle Communications & Public Relations.